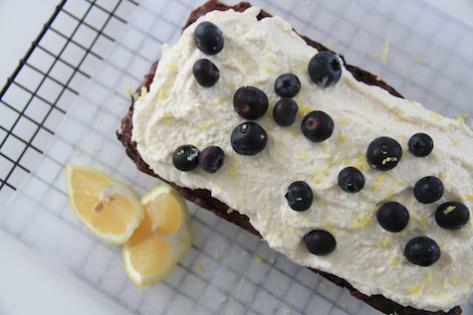 We're practising what we preach with this low added sugar recipe which is simply delicious! In our article on Added Sugar 101 last week, dietiian Kerryn Boogaard gave us advice and tips on how to manage our added sugar intake to just six teaspoons a day. Amongst other things, Kerryn made the point that you can still enjoy many foods which have natural sugar and that it's still possible to enjoy a good diet with added sugar limited to the six teaspoons, which is roughly 24g of added sugar. So to prove her point, Kerryn has prepared this scrumptious recipe for us which combines fresh seasonal beets with chocolate, other yummy things such as low fat ricotta and lemon zest icing plus fresh fruit. And best of all, the cake has just 1.5 teaspoons of added sugar per serve which comes from the honey. Try it! We've tested it. The children (and you) will love it. 1. Preheatoven to 180 degrees fan forced. 2. Combine raw beetroot, eggs, vanilla, ground almonds, cocoa powder, honey, oil and baking powder into a large bowl. 3. Fold through ¾ cup of the blueberries. 4. Spoon mixtureinto a paper lined loaf tin. 5. Bakefor 40-50 minutes or until cooked through. 6. Removefrom the oven and cool for approximately 15-20 minutes in the tin then transfer to a cooling rack until completely cool. 7. While the loaf is cooling, combine the ricotta, lemon zest, lemon juice and vanilla and spread over the loaf. 8. Top with remaining berries and some lemon zest if desired.